Spawn of Griffith | It's a boy! Holy crap! It's a boy! Holy crap! I’m thrilled to share our newest family member with all of you. 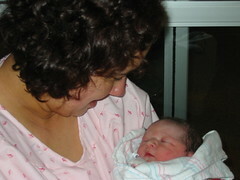 Jackson Henry Griffith was born Sunday, Feb. 12th, 2006 at 9:45 am. He weighed 8lbs 8ozs (wow!) and is 20” long. I’ll be posting a complete rundown on the whole birth and preceding days real soon. In the meantime take a look at a couple of pictures in our flickr account.